The Australian Army wore colour patches from 1915 to 1950, as a means of distinguishing units. In July, 1987 it was decided to permit the wearing of colour patches again, on the puggaree of the hat khaki fur felt; the decision was influenced primarily by the need to foster the Army's heritage. a. Series I are the patches of units of the 1st AIF and the whole Army from 1921 to 1949. These are worn by units which have established their lineage and similarity of role to those earlier units. A small number of these patches have been used as a base for Series II patches for organisational reasons, others as a basis of completing pattern gaps to provide continuing heritage; these patches are referred to as Series I (Extended). b. Series II, introduced in 1995, is based largely on the colour combinations of Series I which indicated headquarters, corps and some functions. These are arranged as square base patches identifying Headquarters Australian Defence Force (Air Commander), Army Headquarters and the functional command headquarters. Smaller overlayed shapes in various colours identify uniquely non-corps units under command of those headquarters, and corps units respectively. These patches are worn by units which have not established lineage and similarity of role for a Series I patch. Entitlement to the wearing of a Series I colour patch is subject to substantial evidence being produced as to clear and direct lineage from a World War l or World War 2 headquarters, unit or independent sub-unit which had an approved colour patch, and a role similar to the present day unit. Granting of the entitlement must be shown to be a factor in significantly enhancing unit esprit-de-corps and morale. As of 17 June 2009, more than 80 Series I colour patches have been approved for wear. The uniquely Australian system of colour patches may have been inspired through the South African War 1899-1902 by some British Army units wearing small cloth patches in colours or tartans appropriate to their regiment on the puggarees of their pith helmets. The Australian system however, was an extension of the system of small flags nine inches square allowed by Headquarters 1st Australian Division in 1914 to mark headquarters and unit lines; AIF Order No. 10 issued in Melbourne on 5 September 1914 provided for these flags in colours, which, with several minor changes, were the basis of the 1st Division's colour patches. Divisional Order No. 61 issued at Mena, Egypt on 6 March 1915 indicated: 'Badges 562. In order the better to distinguish the several units of the Division, coloured patches of cloth 1 &1/4 inches wide by 2& 3/4 inches long will be worn on the sleeve one inch below the shoulder seam. Except in cases of Headquarters of Brigades and the Divisional Artillery, the Engineers and Army Medical Corps, badges will consist of two colours, the lower indicating the formation, the upper the unit etc. Light Horse (4th Light Horse) and Artillery badges will be divided diagonally, the others horizontally. Later in 1915, 1st Division Standing Orders paragraph 35(ii) re-promulgated colour patch detail amending the artillery identification to one colour patch only for all divisional artillery, of crimson over royal blue in a diagonal setting, and replacing the yellow as the colour of the second battalion in each brigade with purple. The Headquarters 1st Brigade colour patch was a green horizontal rectangle, and its battalions (1, 2, 3 and 4) black, purple, brown and white over green divided horizontally. The same system applied to the 2nd Brigade, whose brigade colour was red, with battalions numbered 5 to 8, and to the 3rd Brigade whose brigade colour was light blue, with battalions numbered 9 to 12. Divisional engineers and the signals company wore a purple colour patch, the divisional 'train' (Army Service Corps) dark blue over white and medical corps chocolate. Later divisional unit colour patches were the pioneer battalion wearing a white patch with a purple centre, machine gun companies (later battalions) wearing a black patch with a yellow centre, ordnance dark blue with a red centre, pay corps blue with a gold centre and veterinary maroon. The divisional headquarters patch was black with a white centre. Machine gun units also wore 'crossed guns' in yellow cloth directly below their colour patch, and trench mortar batteries a grenade in blue worsted embroidery directly below the divisional artillery patch if medium mortars, below the brigade headquarters patch if light mortars. 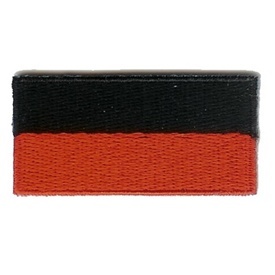 The 4th Brigade, raised separately and never part of the 1st Division, gained approval from Headquarters Australian and New Zealand Division in March 1915 to wear colour patches on the left side of the helmet puggaree, or cap or hat band, the patch measuring l 1/2 inches by 2 1/2 inches, as a horizontal rectangle. The Brigade colour was dark blue and the upper/battalion colours as for the 1st Division; because however, the black and purple of 13 and 14 Battalions over the Brigade dark blue base caused confusion with the Brigade Headquarters' patch, the upper colours for these battalions were changed to light blue and yellow respectively. The Brigade later conformed to the 1st Division method of wearing the patches at the head of the sleeves of jackets. As other divisions of the 1st AIF were formed, they were allocated distinctive divisional shapes -diamond for the 2nd, horizontal oval (sometimes described as ellipse) for the 3rd, circle for the 4th and vertical rectangle for the 5th. The 6th Division, partly formed in England in 1917 to provide reinforcements for the other divisions, but later disbanded before it saw action, was to have worn a vertical oval patch. The 4th Brigade retained its original rectangle patches although allotted to the 4th Division; other anomalies were the 12th Brigade of the 4th Division, which had a dark blue brigade colour with consequent adjustments to the colours of its first and second battalions (45 and 46), and the 8th Brigade allotted to the 5th Division which had yellow as the brigade colour. The light horse brigades followed the horizontal rectangle shape, with the exception of the Headquarters (only) of the 4th Light Horse Brigade and the whole of the 5th Light Horse Brigade, which used a triangle shape. All colours being separated diagonally, brigade headquarters and brigade/lower colours were, for 1st, 2nd, 3rd and 4th Brigades respectively white, red, yellow and dark blue. 5th Brigade also used red, but in the triangle patch. The upper/unit colours in each brigade were, for the regiments in seniority, light blue, green and black, and for the brigade machine gun squadrons, field ambulances and veterinary sections, respectively purple, chocolate and maroon. Nearly 300 colour patches were authorised during World War 1, some initially by divisional orders, the majority later by AIF Orders; included were a number of colour patches later amended or cancelled. (1) The new organisation (CMF) being based on the AIF, authority has been granted to Citizen Forces to wear Regimental Colour Patches on the jacket, similar to those worn by units of corresponding designation of the AIF. Standing Orders for Clothing 1922, including a colour plate, formally authorised 'Distinguishing Colour Patches'. Later authorities were Standing Orders for Clothing 1925, Standing Orders for Dress 1931, and finally Standing Orders for Dress 1935 with later amendments. Some 180 colour patches, primarily those of the AIF, were depicted in the colour plate issued with the 1935 Orders; included however were nine Permanent Troops, two Fortress Troops and eleven non-divisional unit colour patches, apart from the two cavalry and five infantry divisions. On the outbreak of World War 2 and the raising of a 2nd AIF, it appears that 2nd AIF units may have initially adopted the colour patches of their identically numbered or designated 1st AIF forbears, in the absence of any formal instructions. However, probably in April or May 1940 and partly due to the number of battalions in brigades being reduced from four to three, an instruction was issued allocating grey background colour patches to 2nd AIF units and giving infantry battalions colour patches by shapes and upper and lower colours indicating the divisional, brigade and battalion seniority of their 2nd AIF grouping. This resulted in a significant number of battalions wearing colour patches unrelated to those of their 1st AIF forbears. For example, the 2/14th Battalion, at that time being the senior battalion of the 'third' brigade of the 'second' division of the 2nd AIF (the 7th Division), was allotted a diamond-shaped black over light blue patch on the grey background; the black over light blue diamond was the colour patch of 25 Battalion 1st AIF, while 14 Battalion 1st AIF wore a yellow over dark blue horizontal rectangle. There is considerable evidence of this instruction's impact in unit war diaries and official histories, however, no copy of the authority, believed to be an Army Headquarters (AHQ) Director of Ordnance Services instruction with colour plates, has yet been located in searches of Australian War Memorial and Australian Archives holdings of AHQ files of April-May 1940. As a result of representations to members of Parliament by 1st AIF associations and the RSL, this anomaly was corrected in October-November 1940 by the issue of another instruction, probably again by AHQ Director of Ordnance Services. The colour plates assumed to have been issued with the instruction would have depicted divisional-shaped grey background patches (6th horizontal rectangle, 7th diamond, 8th horizontal oval and 9th circle), with battalion colour patches conforming with those of the 1st AIF forbear superimposed. These battalion patches were half-size where the divisional and battalion patch shapes were different, and in full size yet showing a 1/4 inch grey background where the shapes were similar. Due to a significant variety of different shaped patches resulting from regroupings, the 9th Australian division in 1943 was given authority (General Routine Order (GRO) 225/43) to wear the distinctive 'T' patches which in effect also commemorated the major part played by the division in the Siege of Tobruk. These colour patches were illustrated, with two minor errors (2/28 and 2/48 Battalions), in Appendix 4 to 'To Benghazi' by Gavin Long (Australia in the War of 1939-45 Series 1 (Army) Volume 1). By the end of 1944, close to 600 colour patches had been introduced during World War 2, not including changes in colour patch by the addition of the 2nd AIF grey background by militia units transferring to the 2nd AIF. Because of complexities that had arisen, the C in C AMF directed eventual adoption, except for headquarters, artillery 'branches', armoured, cavalry and infantry units, of colour patches of elongated horizontal rectangle shape, to indicate only the corps or 'service' of the wearer. These were promulgated in 1945, but it appears that many units had not adopted them by the time the war had ended. A small number of colour patches were approved for the Occupation Force for Japan in 1945 and 1946. Authorities for colour patches in World War 2 included, to a limited degree Standing Orders for Dress 1935 as amended, AHQ instructions issued principally by the Director of Ordnance Services, and AIF (Middle East) GEO until 1942. In that year GRO issued by AHQ were introduced as authorities and until 1946, when Military Board Instructions (MBI) were used. Whilst there are some claims that about 3000 colour patches had been approved over the 35 years they were worn, there is no evidence for more than about nine hundred, from the authorities issued, checked against AHQ file drawings and the Australian War Memorial's extensive records. However, there is no doubt that some colour patches were worn without authority, and that some authorised colour patches were never worn. The Australian colour patch system was discarded in 1950 in favour of the British Army system of shoulder titles, formation signs and lanyards. Colour patches were worn at the head of the sleeves of jackets and greatcoats in World War 1. Between the wars it appears from authorities that they were worn only on jackets. In World War 2 they were worn as in World War l, except that wear on the right side of the puggaree of the hat khaki fur felt was authorised in 1940, and later on berets beside but rearwards of the badge; miniature colour patches were approved at members' expense and worn above the unit patch (but not on headgear), to indicate previous AIF service. Those who had served at Anzac or in the line of communication from Egypt to Anzac were entitled to wear a small brass letter 'A' on the colour patch of their 1st AIF unit. All told, some 30 different shapes were used, generally to indicate the organisational location of a headquarters or unit. The shapes of the infantry division patches have already been described, with the exception of the 11th Division which had a horizontal arrowhead. The headquarters of the two cavalry division (later 'motor' in World War 2) used respectively a triangle (1st) 2nd a square (2nd). The three armoured divisions of World War 2 employed shapes of respectively an inverted shield, a shield and a combination of both. Notwithstanding this, some armoured regiments and the 4th Armoured Brigade wore patches shaped like World War 1 tanks. Corps headquarters and corps troops units generally wore triangle patches, while higher headquarters and units not allotted to corps or divisions generally wore square patches. Colours used totalled about thirty, depending on the variations in the description of similar colours in various authorities. Generally for units they indicated the corps and/or function. For headquarters other than divisional, they indicated seniority in like-headquarters e.g. the different arrangement of the same colours for Headquarters 1st and 2nd armies, and varying upper colours over the light green used to indicate Headquarters Line of Communication (L of C) areas in sequence e.g. Queensland, NSW, Victoria etc. As well as corps colours used by divisional units described previously, survey units used various arrangements of purple and white arranged vertically, and signals units, from 1922, were identified by a miniature white over sky blue horizontal rectangle superimposed on their original 'engineer' purple patches. In World War 2, the extensive Order of Battle of hospitals and specialist medical units saw an expanded use of the chocolate patch, superimposed with various colours in different shapes. Dental units used burnt orange as their identifying colour, while EME unit colours were scarlet superimposed with dark blue, and military police (then 'provost') had black patches superimposed with white chevrons, originally designed as boomerangs. Garrison battalion's colours were black, superimposed with various shapes in green. There were many other colour combinations denoting specialist units of various types. Green and yellow were the colours used for army schools at various levels. The sizes of colour patches of World War 1 were generally larger than those of World War 2. The World War 2 square patch for example had 38mm sides, with an additional 5mm grey border if 2nd AIF. The 11th Division's horizontal arrowhead was overall 78mm long and 50mm high, as an example of a larger patch. The colour patch system was never designed to confuse the enemy, and colour patches did not appear to have been worn in action after the Middle East campaigns of World War 2. There is no doubt that the system confused some of those who wore colour patches, but there was never any requirement for personnel to remember the detail of the system; usually units grouped together in formations came to recognise the colour patches of their sister units, their higher headquarters and flanking formations. Senior military police of World War 2 have affirmed, however, that the task of identifying and controlling troops in transit and on leave (at the peak of enlistments in World War 2 the Australian Army totalled almost 400,000 personnel) would have been impossible without the colour patch system. The main problems of the system could be summarized as the failure to plan for a complete Army ORBAT, the issue of new colour patches to reflect changes in grouping, changing designs and colours to show a new function, and the desire to have left and right patches on the heads of sleeves presenting the same colour to the front where colours were divided vertically or diagonally. Notwithstanding its problems, the Australian soldier became intensely attached to his unit colour patch, as evidenced by association banners on Anzac Day marches. The Australian Corps Commander in World War 1, Lieutenant General Sir John Monash, recorded in his book 'Australian Victories in France 1918' that 'the private soldier valued his battalion colour patch almost more than any other decoration.' It is this heritage that the Army seeks to enhance with the re-introduction of colour patches 73 years after they were first worn. 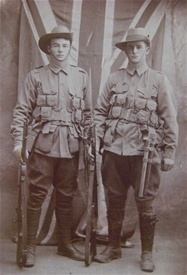 21st Battalion soldiers - circa 1915. Colour patches were worn on the upper sleeves of their uniforms from late 1915.